I Spent Four Days Driving. 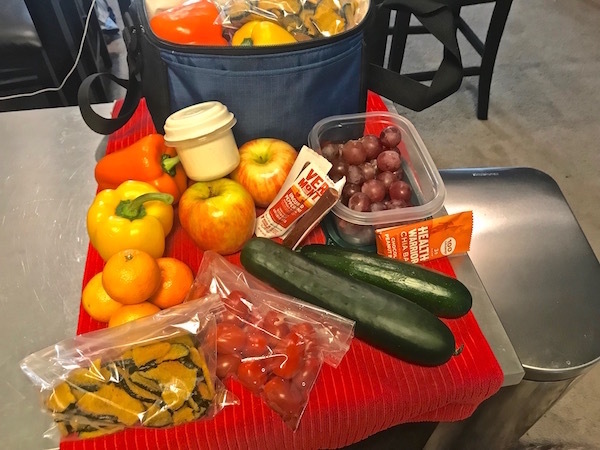 Here’s All The Ways I Stayed Healthy On My Road Trip. | Keep It Up, David! I went on my longest road trip in over a decade last week, to go to my sister’s house in Colorado for Thanksgiving. 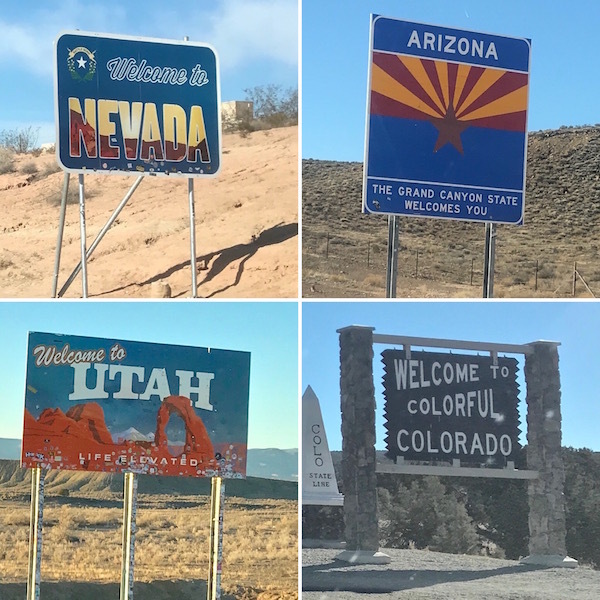 I drove through five states, starting in my home state of California and visiting four others. I’ve gone to Colorado for Thanksgiving for 15 or 16 years in a row, but this was my first time driving. Why? Because someone else came along, too… JJ! It’s 16 hours to my sister’s house from mine, so I planned on two days to get there, and two days to get back, with a stop for the night at a motel in each direction. It is so easy to eat poorly on a road trip. There’s fast food everywhere, and gas stations are more known for unhealthy options than healthy ones. So, for the drive to Colorado, I made a special trip to the grocery store and brought along two days of food. Here’s a fun fact about shopping for produce at the store: if it’s not refrigerated at the supermarket, you don’t need to refrigerate it at home. (You may want to, to keep it fresh longer, though.) And in California, where vegetables are grown, year-round, only a couple hundred miles away, many fruits and vegetables are sold without being refrigerated. So I loaded up on lots of those, so I had stuff that would still be fresh on Day 2, without having to bring a cooler. 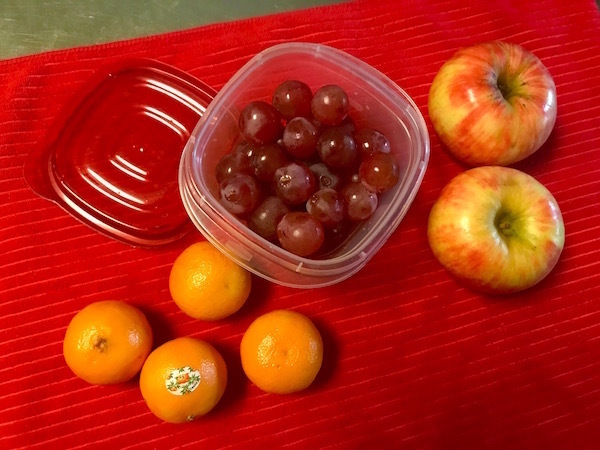 FRUITS: Two apples, four clementines, and a container of grapes. They’re called holiday grapes, which are very sweet, but also delicate, so a few turned to mush when I pulled them off the stems. And the clementines weren’t a great choice, because you can’t really peel them while driving. I ended up peeling them at a gas station and putting the segments in the grape container to enjoy on the next part of the drive. 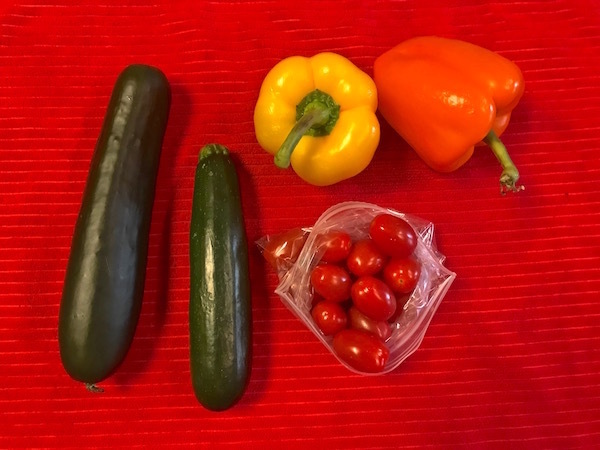 VEGETABLES: a cucumber, a zucchini, two bell peppers, and a bag of cherry tomatoes. As shown in the above picture, I ate them all raw and whole. I ate the tomatoes first, and used the bag as a trash can for the pepper seeds and the ends of the cucumber and zucchini. SNACKS: I ate one Health Warrior Chia Bar (100 calories) each day. I picked that brand because they were on sale. 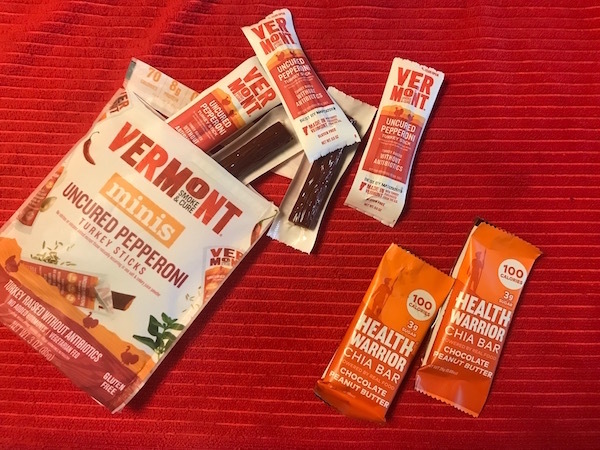 I also bought a bag of individually wrapped pepperoni-flavored turkey sticks, and ate three each day (35 calories each). Lastly, for something crunchy, I bought, at Sprouts, a container of roasted pumpkin chips. 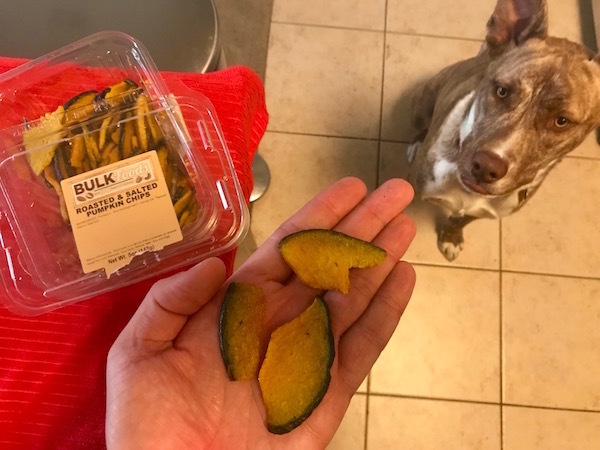 I’ve enjoyed their beet chips and okra chips in the past, but I figured, it’s Thanksgiving – let’s try the pumpkin! They were crispy and salty and hit the spot. I split the container into two bags, and each bag had 325 calories. Here’s everything for Day 2 put together. (Day 1 is behind, inside the lunch box.) The little container on the apples has powder to make a protein shake for Day 2; I drank a protein shake on Day 1 before leaving the house. I also brought with me a gallon jug of water that I kept in my trunk, and a smaller water bottle that lived in my cup holder. I refilled my water bottle whenever I stopped, plus had water to fill JJ’s water bowl. On Day 1, I drove to Salina, Utah, a small town smack in the center of Utah. 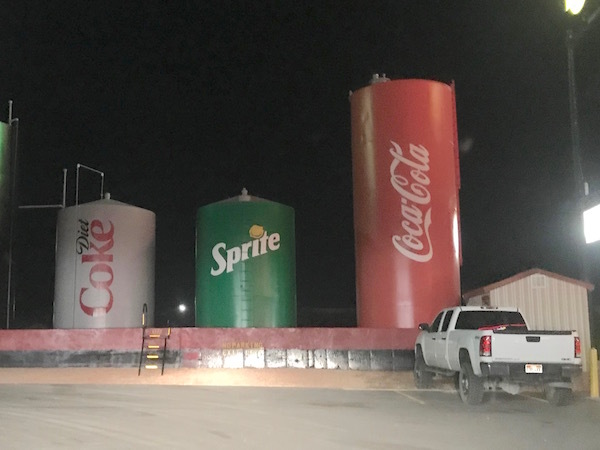 I filled up on gas at a gas station that had the largest cans of soda I’ve ever seen. After checking into the motel and going on a walk and feeding JJ, I headed down to street to Denny’s for some dinner – the only open sit-down place still open, as it was late. 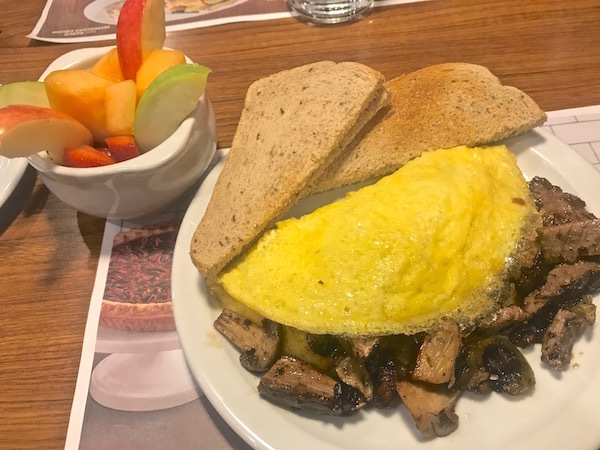 I ordered a Philly cheesesteak omelet, swapped the hash browns for fruit, with dry rye toast on the side. 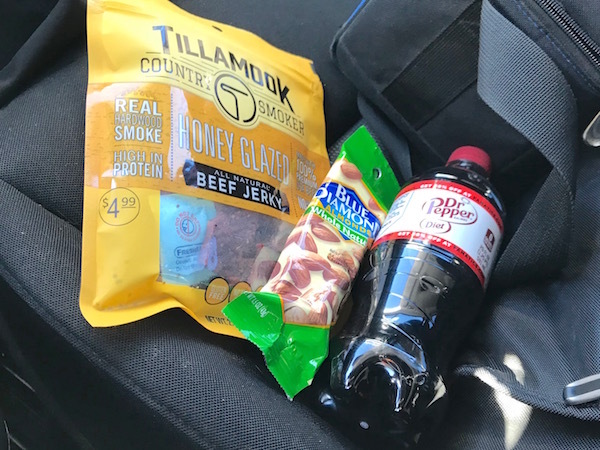 It was great getting on the road on Day 2 with pre-planned snacks to get me the rest of the way to Colorado, but I ended up eating nearly everything in the first three hours of the eight-hour drive. By the time I gassed up in Grand Junction, Colorado, I knew I’d be hungry in a little while. I was also more tired on Day 2 – not enough to endanger my driving, but enough to warrant some caffeine, which I had not planned for on either day. So I bought some gas station snacks. 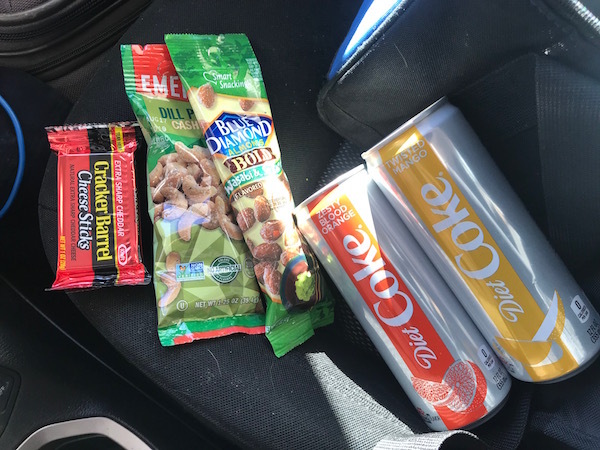 Two cans of Diet Coke, two small packages of nuts, and a piece of cheese. That got me the rest of the way, and I arrived at Sarah and Justin’s house around 4pm, which gave us enough daylight to take JJ and their dog Coco for a nice walk so they could be introduced. (More on JJ and Coco in an upcoming post.) That night, Justin made a delicious meal of lamb and vegetables. I didn’t do nearly as much planning for the two-day drive home when my visit was over. I took two apples and a pound of baby carrots from Sarah and Justin’s fridge for Day 1, which I ate while driving, and then relied on gas station food to take me all the way to my stopping point in St. George, Utah. FIRST GAS STATION STOP: Diet Dr. Pepper, almonds, jerky. 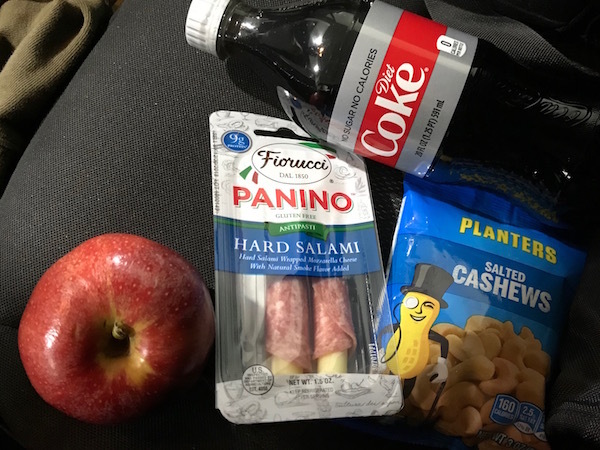 SECOND GAS STATION STOP: Diet coke, an apple, cashews, and a package of salami-wrapped cheese. It was during the second stop that I really had the craving for something hot, and so I indulged in some fast food. There was a Burger King in the gas station, so I opted on a Whopper Jr., with no mayo. 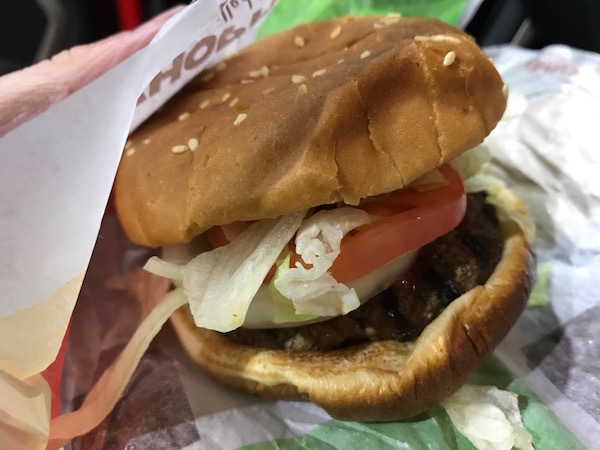 Leaving the mayo off brings the calorie total down to 260 (from 310) – not bad for a fast food sandwich, especially since I didn’t get fries. The sandwich simultaneously hit the spot and wasn’t very good – which can pretty much be said about all fast food, right? It satisfied me in the moment, without sucking me into a fast food shame spiral, so that’s a good thing. And that bun was the only carbs I ate in a very low-carb day, so that’s a good thing too. I managed to hit up a grocery store in St. George before hitting the road on Day 2, which was great, because I was tired of walking past all sorts of tempting things at gas stations to find the nuts and jerky. 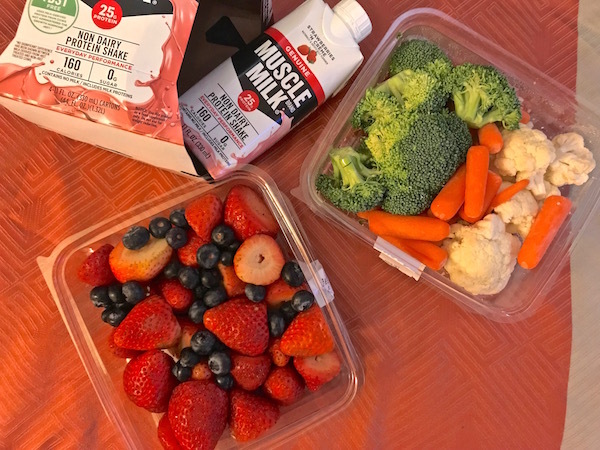 I bought a container of broccoli, cauliflower, and carrots, a container of strawberries and blueberries, and a 4-pack of protein shakes. I only wanted one protein shake, but this store only sold 4-packs. I drank two over the course of the drive, and popped two in my fridge once I got home, to drink in the days to come. 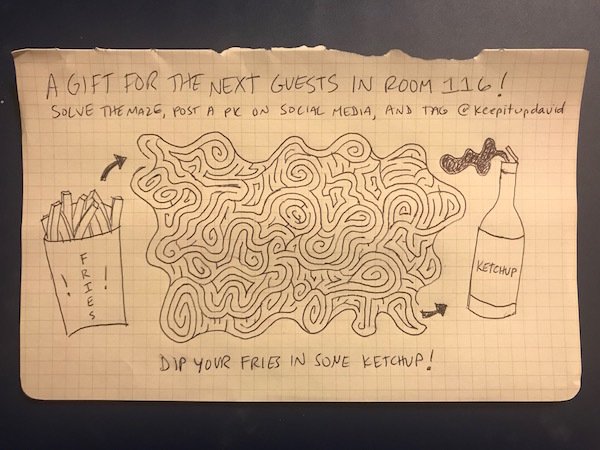 One more thing: I’ve gotten into the habit of leaving mazes on airplanes for future passengers to find (as seen in this post), but since I was driving this time and not flying, I decided to leave a maze in my Salina motel room, tucked into the folder of information about amenities. I didn’t do one in St. George, I was too tired. See more of my mazes by visiting my Etsy page. And there you have it, folks – how planning, prep work, and smart shopping can make keep a road trip healthy. Oh – and I didn’t even mention exercise! More on that in my next post. 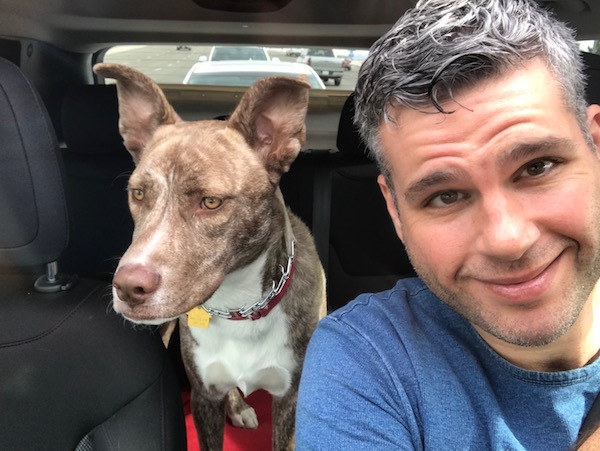 This entry was posted on Wednesday, November 28th, 2018 at 11:13 am and is filed under Uncategorized. You can follow any responses to this entry through the RSS 2.0 feed. You can leave a response, or trackback from your own site. 5 Responses to I Spent Four Days Driving. 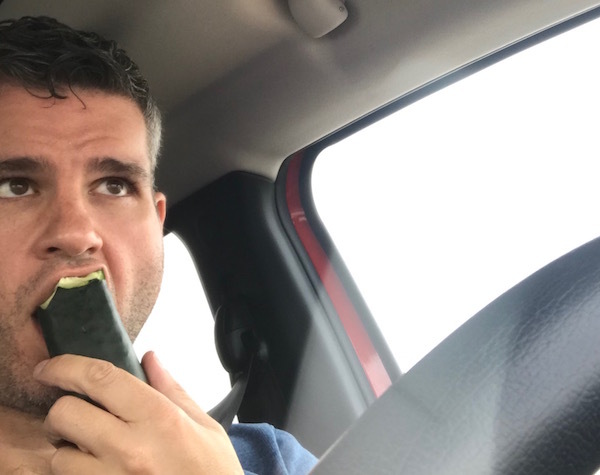 Here’s All The Ways I Stayed Healthy On My Road Trip. I agree with Charlotte, they are a-MAZE-ing! Good job with the road trip food choices! And thank you too! Another maze in my next post, a little later today! Has anyone ever reposted their finished maze?